The main purpose of the application is to equip your hotel guests with useful and practical information during their stay in the hotel. There is no need for internet access in order to use the application. All the information is located in your guest's smart phone to enhance usability and functionality of your hotel mobile application. List of restaurants and bars on interactive maps Events etc. The content of your app is fully dynamic. This means that you are able to choose what information you would like to add for your guests according to your needs. 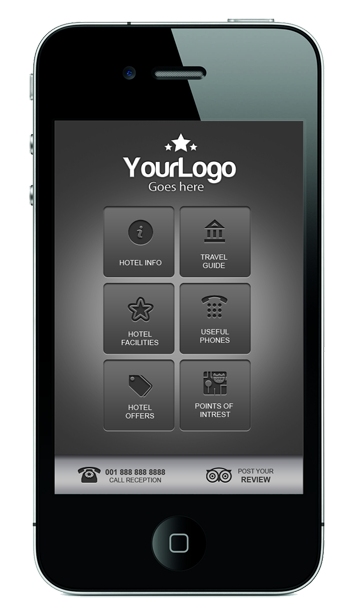 Even if you have a city hotel or a resort, InHotelApp is a fully customizable hotel mobile application. By ordering the App we give you access to the InHotelApp Content Manager where you can manage your content, add categories, events, create interactive maps and publish them automatically to your guests' smart phones.